I can't get enough of pictures of animals wearing clothes. I don't know why. 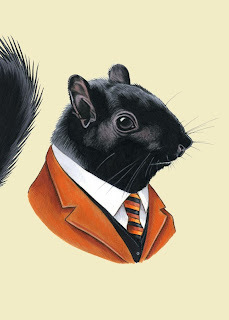 Black Squirrel by the fantastic Ryan Berkley. Having money, or not having it, turns us into forest creatures. Some people are like squirrels: frantic, hoarding. Others are deer: frozen, terrified. And some are bears: grouchy and lumbering. Okay, perhaps this analogy isn't working. What's the point, Britt? Just that money is a wild and wooly thing. As artists we often struggle with financial issues. We go up, we go down. I've been poor for over a decade now. I'm not complaining. I could have chosen a more straightforward path. But I am hopeful that someday soon, things will change. I believe that if you do what you love, money will come. It's just unclear how long that's gonna take. And isn't money kind of the easy part? I mean, most people struggle just to figure out what to do with themselves. If you know what you want, who you want to spend time with, and what kind of person you want to be, I think you're rich. Gather some acorns this weekend, story-makers. See you back here on Monday.